Scholars in grades five through eight make up the middle school student body. 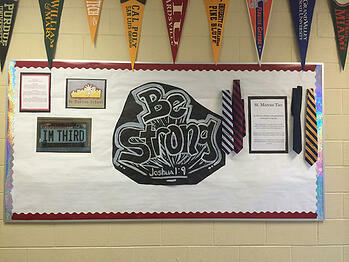 Middle school students are recognizable by their navy blue blazers and blue or red ties. Many stand out by earning silver and blue (honor roll) or red and blue (high honor roll) ties after achieving and maintaining a high grade point average. Scholars in 8th grade who demonstrate particularly strong leadership and character are awarded a gold and blue leadership tie and given special responsibilities and privileges. The middle school culture is one of GRIT, gospel and goals. Rooted in the Word of God and the Pillars of Character (above), students strive toward high school and college readiness. Each year the middle school identifies with a college division, and each classroom represents a college or university within that division. College banners, mascots, and news line the halls, creating a learning environment that looks and works toward a successful future. At the start of the school year, teachers and students embark on camping trips to various sites in southern Wisconsin, forming close relationships and laying the foundation for a successful learning experience. Through team building activities, sharing stories and songs around the fire, preparing meals, facing physical challenges in the great outdoors, and praying together, students grow more comfortable with each other and with their teachers and return to school ready to tackle the year. The first and last day of each week begin with a morning assembly where all middle school classes gather and recite Maltbie Davenport Babcock’s poem “Be Strong”. Class representatives report on their college’s attendance, punctuality, and uniform violations, and students receive a Message of the Day centered on a Pillar of Character. The atmosphere is one of intensity and accountability. Middle school is challenging, especially for students entering St. Marcus in these upper grades, but homerooms are close-knit, and teachers are loving and supportive. Many students new to St. Marcus turn past failures into stunning successes.